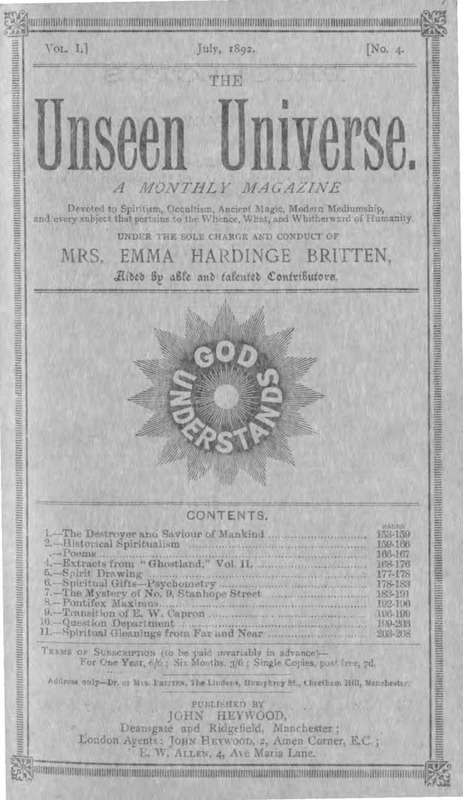 A Monthly Magazine Devoted to Spiritism, Occultism, Ancient Magic, Modern Mediumship, and Every Subject that Pertains to the Whence, What, and Whitherward of Humanity. Manchester, England. Publisher: John Heywood. Editor: Emma Hardinge Britten. Started by Emma Hardinge Britten after she severed her relationship with the Two Worlds (a split described in the first number's "Introductory"). Emma published, "by permission of the author," the continuing adventures of "Louis," the author of Ghost Land, including further experiences with the Berlin Brotherhood and Louis Gray's travels to New York City to meet John Cavendish Dudley. NYPL; Cambridge University.